This energy saving kitchen, as shown in Figure 1, was designed by the University of North Dakota, Agriculture and Home Economics. This kitchen is designed to reduce the amount of physical movement while preparing and cooking meals. The design also includes a workroom with laundry appliances. 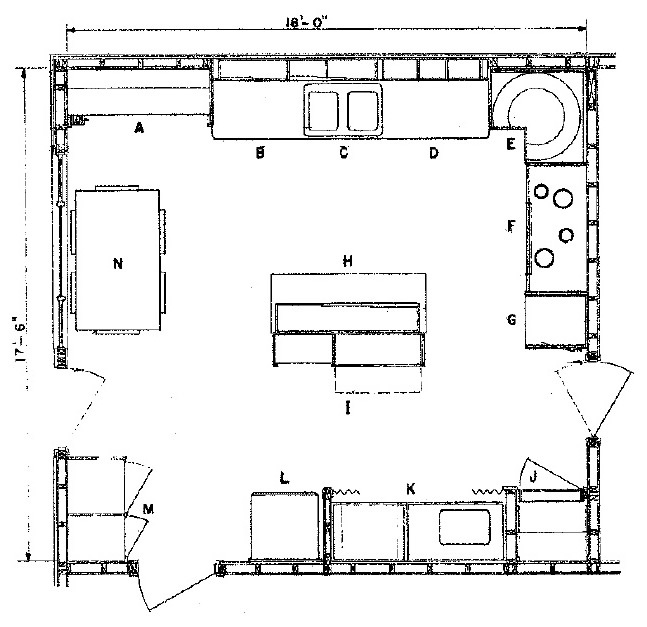 The overall kitchen and workroom are 18' 0" X 17' 6" and include space for a table and six chairs. The energy saving kitchen design incorporates modules or work centers. These kitchen plans have excellent detailed drawings. Wax paper, aluminum foil, etc.